An atherectomy is a minimally invasive procedure performed on blocked arteries in the extremities where the offending plaque is pulverized (the “roto-rooter” procedure). These blockages, known collectively as Peripheral Artery Disease (PAD) are common age-related conditions affecting upwards of 7 million people in the United States. 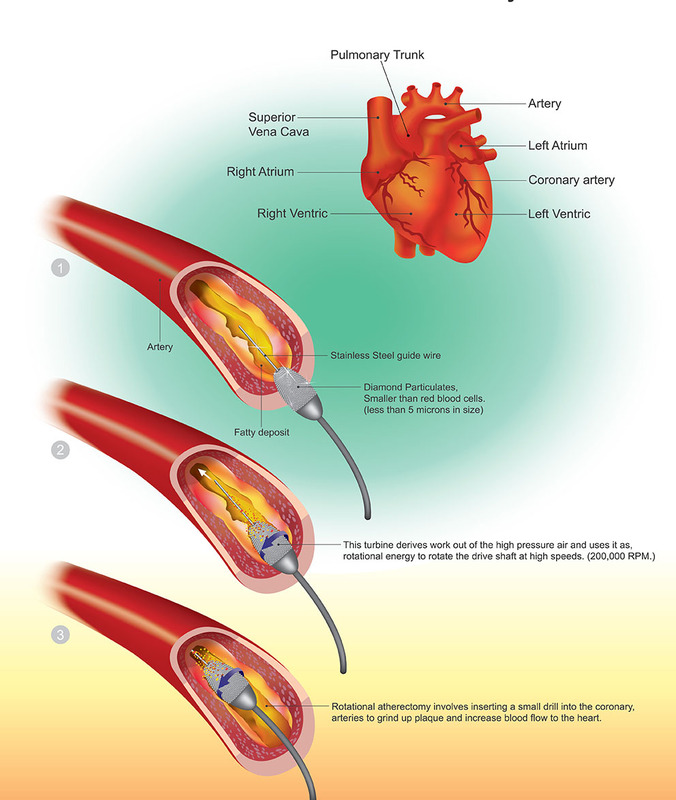 The technique, delivery mechanism and results of the atherectomy are somewhat like an angioplasty. However, the atherectomy pulverizes and removes plaque from the blocked blood vessel wall while the angioplasty compresses the plaque in place against the blood vessel walls. An atherectomy is usually indicated when the plaque blockage is particularly hard or calcified or when blockage returns in a previously placed stent. In many cases an atherectomy can be performed along with an angioplasty and stent placement with excellent success rates. During the procedure, your cardiologist will insert a catheter into the blocked artery, threading it to the blockage site. Depending on the type of atherectomy being performed, the catheter will have a special tip made specifically to remove the plaque build-up. This may be a sharp blade or even a laser. 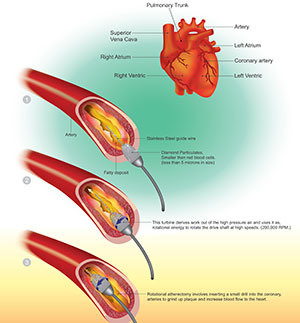 Directional coronary atherectomy involves a specially made minimally invasive device with a tiny cutting tip that rotates at high speed to cut away plaque in the artery. A small balloon dilates the blood vessel to improve the efficacy of the procedure and protect the vessel walls. The resected plaque is aspirated and removed from the bloodstream. Rotational atherectomy is used for particularly difficult or calcified blockages and is the preferred method of preparing a heavily blocked artery for stent placement. The device rotates at extremely high speed, up to 180,000 and as a result, breaks the plaque down to such a small size that it can pass through the bloodstream with no adverse effects. A laser atherectomy employs a laser light beam in short bursts to vaporize the plaque build-up within the artery. It is often employed for previously failed interventions and when the plaque build-up is not heavily calcified. The resulting blood flow improvement from any of the above techniques is seen within minutes and is long-lasting. A stent is usually placed in the blockage to enhance results. No general anesthesia is needed and patients can return to normal activity the day after the procedure. Atherectomy is not performed on every patient with PAD. You and your physician will decide whether a directional or rotational atherectomy is right for your circumstance. This procedure is indicated for a small subset of patients with difficult-to-manage PAD because of the heavy build-up of calcified plaque. While the procedures mentioned above are minimally invasive, requiring no general anesthesia, they are complex. You and your doctor should discuss the potential risks as well as the pros and cons as it relates to a balloon angioplasty. When an atherectomy is performed by an experienced physician such as those at The Heart House, complications can be minimized and results are excellent.